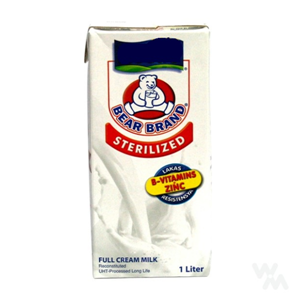 Sterilization is the complete destruction or elimination of all viable organisms in/on object being sterilized. The process destroys yeasts, molds, vegetative bacteria, and spore formers, and allows the food processor to store and distribute the products at ambient temperatures, thus extending the shelf-life. 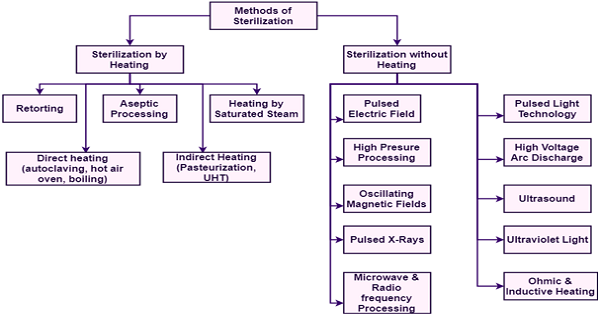 Sterilization procedures involve the use of heat, radiation, or chemicals, or physical removal of cells. I. The product must be heated at 110-125 degrees Celsius. II. After this, the product requires a few minutes to equilibrate, since the surface will be hotter, and the central portion of the container will still be cool. The equilibration stage allows a reduction in the temperature gradient. III. Next, the product must be held at this temperature for a certain period of time to ensure a predetermined sterilization value designated by the F0 value. IV. Finally, the product has to be cooled down mainly to arrest further heat treatment and to avoid bursting of the container at hot conditions. Non-thermal processing is considered an effective method that does not cause any deterioration of quality, in contrast with thermal processing. For example, thermally processed milk may have a cooked flavor accompanied by a loss of vitamins, essential nutrients, and flavors. During non-thermal processing, the temperature of the food is held below the temperature normally used in thermal processing. In addition, non-thermal processes use less energy than thermal processes.